Sosian sits within the heart of 3 diverse intersections of Laikipia’s communities, made up of Samburu, Turkana and Pokot tribes, each with their own fascinating cultures and traditions. Northern Kenya is remote and rural and much of Kenya’s development and infrastructure has not yet reached these communities. At Sosian we have lovingly built up a successful business and therefore feel a sense of responsibility to the less fortunate in our area. Our corporate social responsibility (CSR) efforts are outlined below. Laikipia is a semi arid environment where the land is of poor quality. Therefore small scale farming is very hard and job opportunities in these rural areas are limited. Businesses like Sosian have become key employers in this area as jobs in tourism and cattle ranching support many of the local communities. At Sosian we employ approximately 120 people from our neighbouring communities. So this means that 120 families (700-800 people) are directly supported though these employment opportunities alone. We aim to employ from the communities and train all our staff on site in aspects of tourism, ranching and anti-poaching, thereby giving them the chance to progress when many did not even have the opportunity of secondary school. Sosian operates a program supporting our local school just 3km from the ranch, where 330 children attend daily. Primary school education is free under the government in Kenya but this is not the whole picture. While school fees are subsidised, the numerous extras such as books, stationary, desks, sports equipment and even basic sanitation are not covered. Many of these parents are subsistence farmers living in a harsh environment aiming to provide enough money to simply feed their families from day to day. This is a community that needs its children to succeed and provide for parents and families in the future. Over the years Sosian has contributed heavily to the building of new classrooms, bathrooms, kitchens, desks, playground equipment as well as providing teacher salaries and offering scholarships for secondary education. School visits may be arranged and the staff and pupils are delighted to meet guests from Sosian. A real highlight for us all was a visit from HRH Duke of Cambridge to the school to see the work being done. Please do get in touch if you would like to learn more about how you can help too. As with many other basic needs that are not always met in these rural areas, Sosian also actively supports our local health clinic, which is underfunded. We contribute to the nurses’ salaries and help with medical training. This clinic is vital when it comes to immunisation, basic health issues and family planning. Family planning advice is something we feel strongly about at Sosian as it empowers women to choose how many children they have and to have the opportunity to embark on education and ultimately employment. With the Kenyan population multiplying at an alarming rate, family planning is possibly the single most important issue to address in this country. Nearly all the environmental degradation in Kenya, such as deforestation, wildlife poaching, habitat encroachment, over grazing and diminishing water sources are due to too many people. As women choose to have less children they begin to take control of their lives and not only become employable but also become financial contributors to their families, thus creating a snowball effect of an educated and employable population, who generally have less children. Living in a pastoralist area, livestock are often the only form of income for many members of our communities. However, as cattle numbers increase and areas of grazing decrease, we are seeing the stark need for quality over quantity. Many of our neighbours have always judged wealth by the number of cattle you have, no matter how malnourished they are. We are working together with the pastoralist people to move away from quantity and strive for quality. 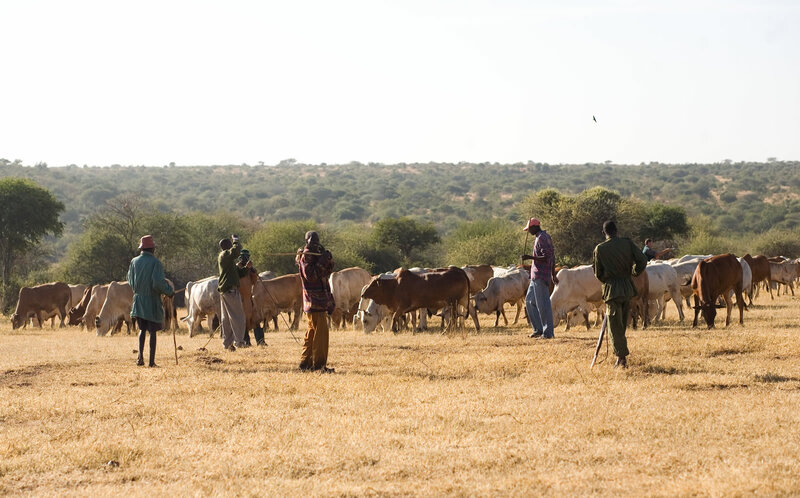 Through the Sosian Cattle Trading Project we buy up community cattle in the dry times, offering good prices when the market prices would otherwise be very low. We then fatten the cattle on Sosian grass and sell to market. On average this scheme injects approximately $250,000 directly back into the communities every year. Additionally we lend out our high quality stud bulls for the communities to use on their cattle. By improving the genetics and quality of their animals they are beginning to get bigger and meatier cattle, which bring in much better market prices, thus allowing many pastoralists to have less animals without sacrificing financial gain.